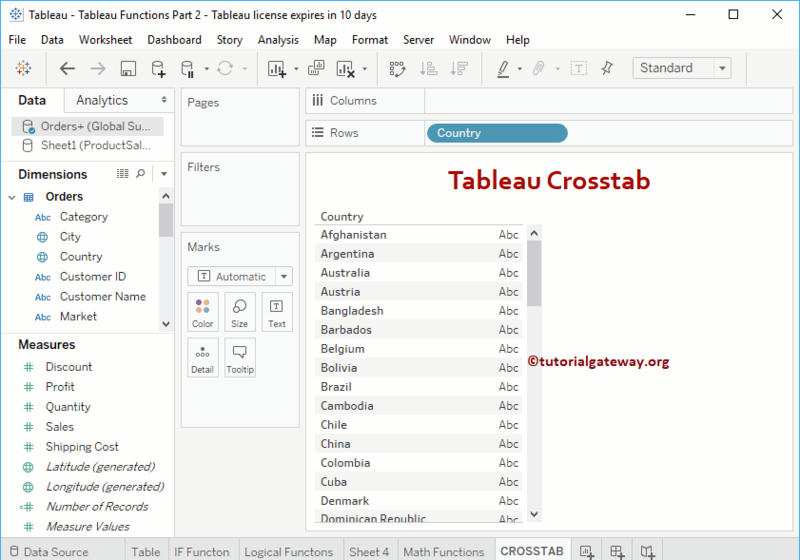 To create textual output in Tableau, you use a Text Table. If you were showing sales by Region, Ship Date and Customer Name, you’d get something like the following: If you were showing sales by Region, Ship Date and Customer Name, you’d get something like the following:... Would appreciate guidance on creating a list parameter that could act like a slicer to allow users to choose between showing two different values (commitments or disbursements). I am used to working in Tableau which allows you to define a parameter and filter for different values. Drag and drop each sheet or report to the upper-right white area. Once the sheets are dragged in, Tableau will try to map and create relationships between them. I have tableau desktop. I am creating a report using 5 tables out of 5 table 2 tables are big. These tables are joined and applied filter. extract creation taking a long time (6-7 hours and still running). big tables have 100+ columns, I use only 12 columns to build my report.